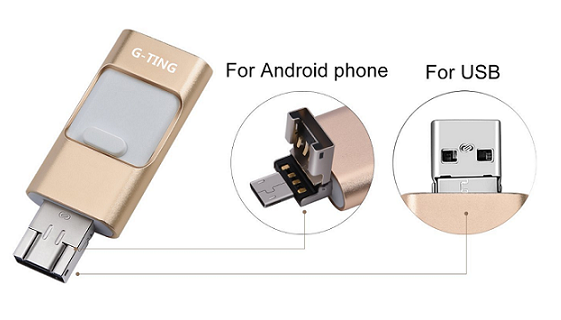 G Ting is a first of its kind USB flash drive which has double connectors, easy to use on multiple devices with variety of usb port options. It is the first in the world to have all three types of connectors combined in one tiny usb drive. Now forget worrying about buying multiple usb connectors and enjoy lot of extra storage for your idevices, smartphones and your computers. It also has smart encryption software which protects your files so that you can share your usb drive for some use to others keeping your sensitive files secure. You can store all your files, media, movies, songs on this tiny gadget and have it on todays smart devices. It is 100% compatible with Apple devices without any error message and even support to all lightening devices. G Ting is an excellent memory expansion connector with multi usb connectors in-built. This way you can free your SD card slot and carry your data from one device to another devices in most easy ways. It also has amazing transfer speed of up to 80 Mb/s read and 40 Mb/s write. G-TING is supported by friendly i-Easy Drive App which enables it to be compatible with most of the file formats. It is a must have connector + memory stick whether you have iPhone, ipads, mac, laptops or desktop computers.